Daryl Powell: "We haven't been fantastic at times but we are getting points." COACH Daryl Powell believes Castleford Tigers are continuing to “move in the right direction” ahead of Sunday’s Betfred Super League clash against Wigan Warriors at the Mend-A-Hose Jungle (3.30pm kick-off). 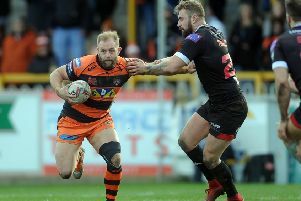 After being trounced 46-6 at St Helens in the opening fixture, the Tigers have won their last three matches, beating Widnes Vikings, Hull FC and Salford Red Devils. A dominant first-half display saw them defeat Salford 22-8 last Sunday and they are now just two points adrift of Sunday’s visitors Wigan who are second in the table with four victories from five games. “We’ve managed to win some games after our initial performance at St Helens so that’s a massive positive for us,” said Powell. The Tigers boss was pleased with the first 40 minutes against Salford but he was frustrated with his side’s second-half performance. “I thought there were some great signs in the first half. Our ball movement was good, our kicking game was good and we defended really well,” he added. “We were 20-0 up at half-time so maybe we just thought the job had been done and clearly it hadn’t. “I thought it was a frustrating second-half and we want to be a little bit better than that. “I think every game throws up it’s issues that you need to fix up and we had a few last Sunday we need to get better at. “There were some signs in the first-half we were getting where we need to be.